Another month, another RPG from Compile Heart. Not that that's a bad thing though, as I quite like Compile Hearts' Mugen Souls Z when I reviewed it back in June. Personally the RPG genre is something I literally can't get enough of. I'm sure I've said this before, but an RPG can offer an entire array of play styles, locations, characters and customization that no other genre can match. That said, not every RPG matches that criteria, and neither is every RPG worthwhile. But though Mugen Souls Z didn't exactly rock my world, I was quite keen on cracking into another adventure by the same developer. So, is their latest offering worth your money? Yes, if you like your RPGs that are light on exploration and interaction but heavy on combat, that is. Developed by Compile Heart and out now on Playstation 3 comes Fairy Fencer F, a game that is clearly trying to kick off a new franchise, which after playing it, is a franchise I'll keep coming back to. Though it very clearly falls in line with what looks and plays like a typical Compile Heart game, there's a level of finesse and polish here that makes it stand out from the rest. You take on the role of Fang, a loser whose only care in the world is what meal he'll be having next for dinner. However, Fang decides to take on the challenge of pulling an ancient sword from a stone, you know, pretty much like King Arthur. But while Fang isn't noble, courageous or strong like King Arthur, he nonetheless manages to remove the sword from its resting place. In doing this he releases a fairy named Eryn, who after quite a lot of convincing persuades Fang to try and free other fairies from other ancient swords. These swords are scattered across the world, and it's up to you to find them, free the fairies inside and save the world, naturally. 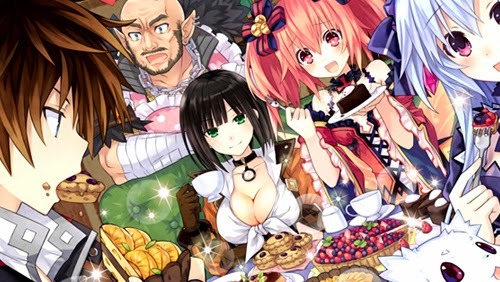 The plot is pretty much a by-the-numbers Japanese RPG fare, but thankfully the colourful cast of characters help elevate Fairy Fencer F quite a bit. For instance, though Fang starts off as quite an annoying character, his banter with the fairy Eryn makes for some of the best highlights of the game, and this level of whimsy and fun between characters continues throughout. Fairy Fencer F's gameplay both in terms of exploration and combat is incredibly reminiscent to that of Hyperdimension Neptunia, a 2010 RPG also created by Compile Heart. However, “exploration” may be a strong word here, as levels in Fairy Fencer F are rather small with minimal room for any non-scripted adventures. Also, despite there sometimes being various paths through levels, they always lead to the same place. This also extends to the many towns you will visit, which are merely represented by clickable menus in order to quickly teleport to locations. It's a little deflating to play through any RPG and not have a sense of utter freedom, but in Fairy Fencer F's case it's not really an issue, as the game puts more of a focus on combat and action rather than jogging around various locations chatting with spikey haired folk. As expected combat goes down the turn-based route, and it does so quite well. On the combat field when a player takes their turn, they can move within a particular radius. This puts a fresh perspective on combat, as you'll find yourself trying to strategically position your team members for the advantage in a battle. Characters have the usual physical and magic attacks at hand in Fairy Fencer F, and you'll need to grind to truly unleash the true potential of every move in your arsenal. Though I tend to dislike heavy grinding in an RPG, doing so in Fairy Fencer F was a breeze, as the combat is just so masterfully achieved. Though some of the longer magic attacks in the game can become quite repetitive, hitting the L2 button instantly skips a battle animation. You'll end up using this quite a bit later in the game, as this effectively speeds up combat to a thrilling and insanely fast rate. A nice little touch to combat is the fact that characters can merge with fairies to transform into anime-esque creatures, which allows them to lay waste to enemies on screen in an incredibly over-the-top and classically Compile Heart fashion. Fairy Fencer F comes together as an RPG that has been heavily streamlined in the way of exploration and interacting with world characters, in place for a focus on combat. Though it does tend to make some missteps -especially when it comes to its learning curve- any RPG fan out there will have a blast dipping into the 20+ hours this adventure will offer. Here's hoping for a sequel! Fairy Fencer F is your RPG choice this week and gets a 4/5.